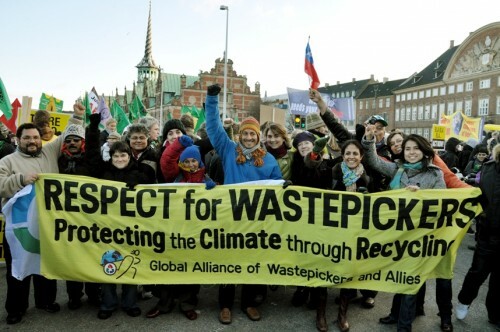 The Global Alliance of Waste pickers is a networking process started after the 1st World Conference of Waste pickers held in Bogotá, Colombia, in 2008. Waste pickers organizations and allies from more than 30 countries participated in this first global event organized by the Bogota Waste Pickers’ Association, Kagad Kach Patra Kashtakari Panchayat waste pickers’ collective of Pune, India (KKPKP), the Latin American Waste pickers’ Network, Avina Foundation and Women in Informal Employment: Globalizing and Organizing (WIEGO). Since then, an International Steering Committee has met once a year in Durban, Belo Horizonte, Bangkok and Pune to give direction to our strategic vision and work. We’ve helped develop organizations in Africa, Latin America and Asia, and participated in several United Nations Framework Convention on Climate Change (UNFCCC) meetings since 2009, where thanks to the support provided by the Global Alliance for Incinerator Alternatives (GAIA) we advocated for alternative funding mechanisms to support fair and just solutions to climate change. The Global Alliance is currently focusing on the sharing and exchange of information and solidarity among thousands of waste pickers’ organizations, with the support and coordination of WIEGO and contributions from waste picker leaders and allies across the world. The Latin American Network, (Red Lacre), is an organization that represents and involves labor movements that unite waste pickers throughout Latin America. Red Lacre is one of the founders of the Global Alliance and its mission is to improve the working conditions of waste pickers and to initiate dialogue between countries in order to share experiences, organize, and take action. The network represents waste pickers’ groups in 15 countries and has been holding regional conferences or assemblies every two years since 2005. The networking process in Latin America was originally coordinated by the Colombian and Brazilian national waste pickers’ movements — among the strongest and longest-standing in Latin America — and is supported by the Avina Foundation. Red Lacre’s leadership is decided democratically at the network’s assemblies. The Alliance of Indian Waste Pickers (AIW) is made up of over 30 organisations that work with waste pickers in 24 cities in India. AIW is engaged in activities that highlight the contribution of waste pickers and strives to integrate waste pickers into solid waste management. Its activities include organizing workshops and exchange programs, bringing together large numbers of waste pickers for city, state, and national events, and facilitating the participation of waste pickers in the UNFCCC processes all over the world. The organizing process of AIW as well as the support provided to waste pickers’ groups and allies in Asia (Bangladesh, Philippines, China, Nepal) is coordinated by KKPKP and supported by WIEGO. The organizing process in Africa has been carried out by WIEGO, with a program to identify and make contact with waste picker groups throughout Africa. It is supporting the South African Waste Pickers Association, the Book Diomm association in Senegal, the developing Kenyan Alliance, and the network of the Democratic Republic of the Congo. StreetNet International, the international alliance of street and market vendors, is also assisting by encouraging its African affiliates to organize waste pickers in their respective countries.